You might have seen us one day. Very often on our walk, Gus will discover a stick lying by the path, and he’ll decide to carry it home. Now, this probably doesn’t seem unusual. 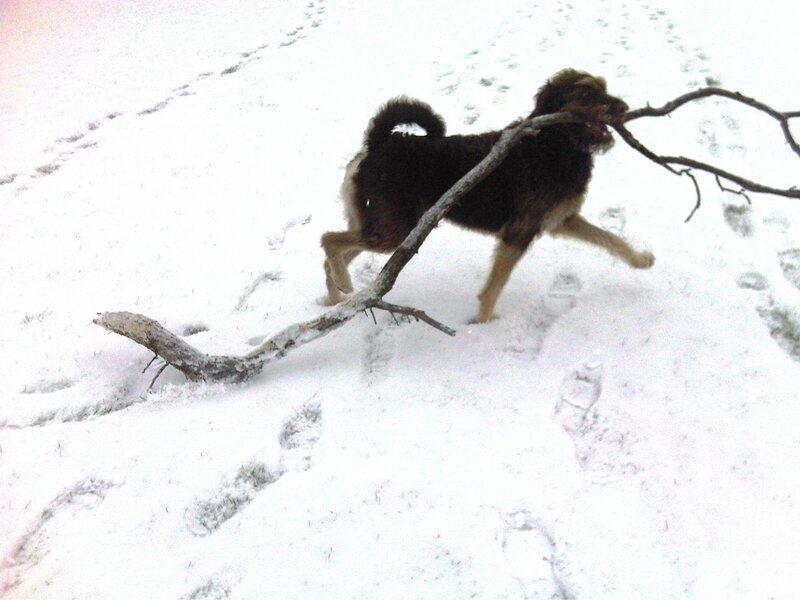 Most dogs will pick up sticks. But most dogs don’t go after the kind of sticks that Gus does. 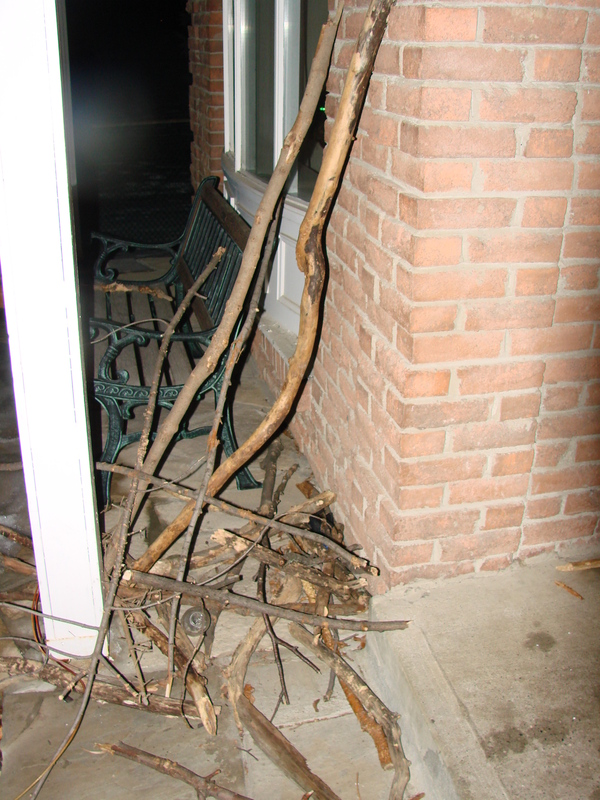 As you can see from the photo above, the sticks that Gus brings home are often bigger than he is. Sometimes we even have trouble on the sidewalk because his stick takes up so much space! It’s not uncommon for people walking or driving by us to honk, laugh, and give Gus the thumbs up sign as he proudly marches home with his trophy. It’s quite a sight to see. I’ve always said that I would do well to have the kind of confidence that Gus does. When he comes upon a giant stick lying there, you can just see him considering it, and sizing it up. Then, without hesitation, he will pick it up and position it in his mouth for the long walk home. He never seems to even entertain the notion that he won’t be able to manage it. 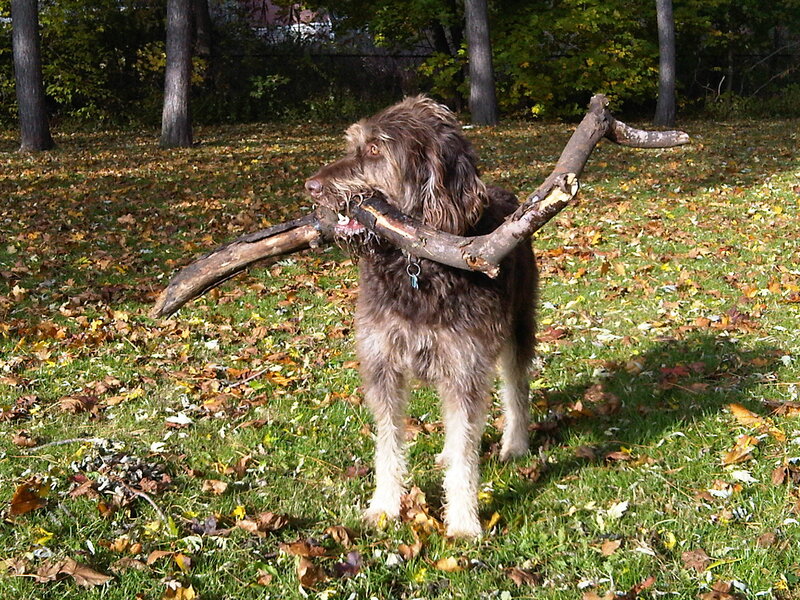 Occasionally I have even tried to discourage him, saying “no Gus, that one’s too big!” But he will always forge ahead; often wrestling with the largest sticks until he can get a good grip on them. His behaviour shows that he doesn’t even consider the possibility that he won’t be successful. You probably think that I’m crazy for letting him carry all this wood home. Take a look below, and you’ll see what he accumulated during a couple of weeks last fall. I guess I just feel that, since he’s so confident and determined, he’s entitled to have the reward of carrying his treasures home. When you are setting goals for yourself, do you reach high and go after the biggest stick? If you’re like me, you often hesitate and feel limited by all the reasons why the goal will be challenging to achieve. Can I really do it? Am I qualified enough? Will people listen to me? This would be like Gus looking at a stick, and hesitating while thinking, “Is it too big? Will it hurt my mouth? Will I bump into things on the way home with it?” When we focus on the obstacles in our path, then we have a tendency to trip over those obstacles, and allow them to get in the way of achieving our goals. Or perhaps they make us worry too much, and cause us to drop our standards and set our sights on some easier goal. It’s like settling for a smaller stick because you feel that it will just be easier to manage. 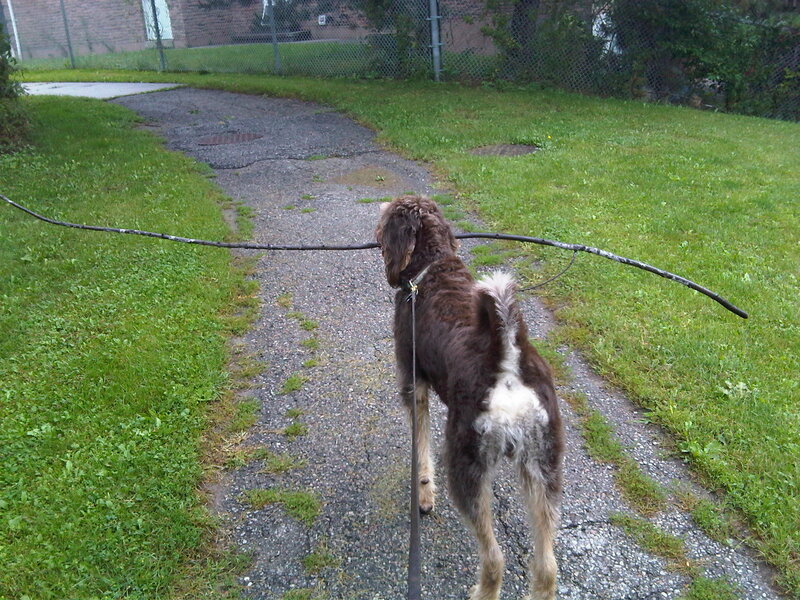 If, like Gus, we refuse to think that way, and we just know that we can carry home that big stick, then we don’t even see any obstacles, and our actions will surely lead us to be successful. If you don’t believe me, just take a look on my front porch! After I finished posting this, I came upon this quote that I think is quite relevant – I think you’ll agree.